I'm not quite sure if I had any particular plans for this Friday evening, but when my colleague came in with a robin that he had found dead outside (probably the first casualty of the windows of the new enviromental processing shed), I knew any plans would be cancelled. Skeletal preparation is not my favourite activity, but beggars can't be choosers, particularly if they aren't rich enough to buy their specimens, nor in possession of a garden to bury carcasses in. This was the smallest animal I've prepped, and I can't say I'd love to do it again. Well, plucking the feathers was very quickly done, but as for the rest: fragile, tiny bones that I really didn't want to damage when I was removing flesh and guts. It's halfway done now: most of the meat on the limbs are gone, tendons remaining. The spine and the head are a pain in the neck to get clean (small and fragile) and the kidneys are fiddly to remove from the synsacrum. Hopefully an overnight soak will make it easier. I really don't want to spend too much of the weekend cleaning teeny tiny bones. Last Monday I went to the National History Museum in Tring, to check some mystery bird bones against their skeleton collection. They have a huge collection, with birds from all over the world. But most importantly for my part, they also have a comparative collection, where the main bones from several specimens are collected by bone type, so you can compare your mystery bones between bones from different genera and species. This is of course much quicker than having to go from species to species. And once you have pinpointed the genera, you can if necessary go to the main collection and try to get the species right. It’s not always worth the time, as some species have minute differences and/or large overlap in size or great variation of morphological features. And that’s without acknowledging the possibility for birds from Africa or Asia being swept off course and ending up in Europe. The day went well, and I could add buzzard, curlew, diver (either red-throated, black-throated or great northern diver) and gannet to the species list. I also did a quick genus id comparison for diver and grebe. I like the Natural History Museum in Tring. It was founded in 1892 as the Walter Rothschild Zoological Museum, being part of the Baron’s private collection. Parts of the building is still Victorian, but the majority of the galleries are modern, even if the specimens inside can be old. One of their more unusual exhibits is the domestic dog gallery, featuring, you guessed it: domestic dogs. Most of these dogs died a long time ago, and it is interesting to see how the species have changed over the years. 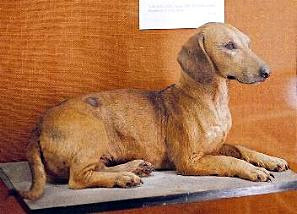 Did you know that in the early 20th century dachshunds looked like this? Quite a difference from today, isn't it?